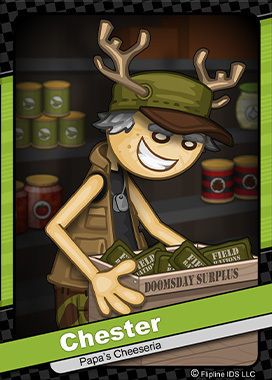 Chester is a pessimistic old man from the town of Toastwood. He is considered somewhat of a busybody around town, and is always trying keep up-to-date on all the neighborhood gossip. Chester is convinced that the world is coming to an end. He has spent a good deal of time and money amassing supplies in his underground bunker behind his cabin. Over the years, Chester has been honing his survival skills by living off the land and forgoing most of the utilities the town of Toastwood provides its citizens.